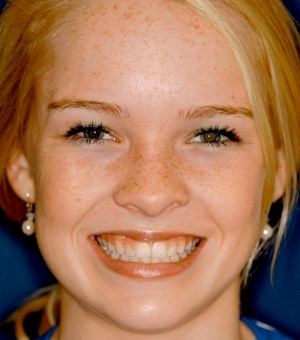 Can no-preparation porcelain veneers work for any patient? At the bottom of your Lumineers section on your website, you have a photograph of Dr. Arnold’s patient who just had her braces taken off and wanted her teeth to look bigger. 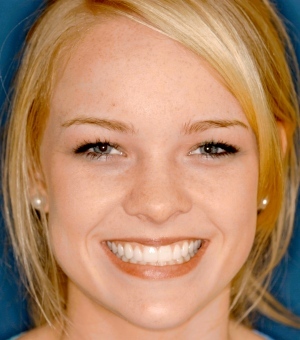 Do you think this beautiful result was achieved because she had tiny teeth to begin with? Was that what enabled her to get away with a no prep and a non bulky result? Thereby making this less achievable to a patient with average-sized teeth. Realizing that he used his own ceramist to better control the result as well. You are referring to a case done with another brand of ultra-thin veneers, not with Lumineers, that is posted at the bottom of our Lumineers page. I have posted the full-smile photographs below. Yes, you are correct that a factor in the success of this case was that the teeth were a little on the small side to begin with. There has to be some care in case selection if the dentist is going to use a no-preparation technique. Not every porcelain veneer case is going to be a candidate for no-preparation veneers. Even with the veneers as thin as 0.3 mm, that is adding to the thickness of the teeth, and a little bit will be added to their length. If you look at the “after” photograph of Dr. Arnold’s case, you will see that the incisal edges of the upper front teeth are maybe a millimeter closer to her lower lip, so he lengthened those teeth about a millimeter. Also, the teeth were straight. If a tooth is crooked, there will be a portion that will be sticking out, and that will have to be trimmed back in order to get a beautiful result. And then Dr. Arnold, since he wasn’t using the Lumineers brand, was free to use his own master ceramist, Michael Morris, who is also very talented. I will repeat here what I have often said about the Lumineers brand. The company that makes Lumineers restricts their use to their own dental laboratory, which is why I don’t recommend Lumineers. I have yet to see a Lumineers case that has resulted in what I would call a beautiful smile. But this result by Dr. Arnold, as well as other cases I have seen, are truly beautiful. I have met Alexandra (this patient) in person, and even as a trained, accredited cosmetic dentist, I could not tell that she had anything but her own natural teeth showing in her smile. Which costs less, DURAthin veneers or Lumineers? Dr. Hall, what is the price of Durathin verses Lumineers? I would like to know which one is less expensive. I like the picture of the Durathin much better. I need to change how you think about porcelain veneers. They are not a commodity like a necklace that you would just go to a store and buy and it doesn’t matter what store you get it from. The actual cost of the porcelain I would guess is in the neighborhood of 1% of the cost that you pay as a patient. And I’m just guessing at that because even as a dentist ordering veneers from a lab, I never even thought of that. What you are paying for is the labor and the skill in taking that material and making it into a beautiful smile. Let’s take my guess of $10 as the value of the porcelain in a veneer. The laboratory technician (ceramist) will mark that up to maybe $100 to $300, depending on his level of skill, and that is what the dentist will pay. Then the dentist will mark that up again to $1000 to $2500 which will be the cost a patient will pay for a single veneer. And how it looks depends much more on the skills of these people than on the material itself. The reason Lumineers don’t look very good is that, because of trademark restrictions, they have to be made in the Lumineers lab, and they’re not a good lab in my opinion. DURAthin and other brands can be made by a ceramist of the dentist’s own choice. With a highly artistic dentist and ceramist, you get a much more beautiful result. Some dentists will charge very little for Lumineers–maybe around $500 to $700 apiece. I wouldn’t let any of those dentists anywhere near my front teeth. Some dentists will charge that same amount for other brands of porcelain veneers. Same story–stay away. I would say that in Virginia, you should be able to get a quality smile makeover from one of our recommended cosmetic dentists for somewhere around $1000 to $1200 per tooth. And that would be with DURAthin veneers or some other brand of ultra-thin veneers, which seems to be what you want. Be very selective in who you go to. Remember than only 1-2% of dentists have the artistic skills and training necessary to create a beautiful smile makeover. Today I have been looking at photographs of smile makeover cases done with DURAthin veneers. I must say that I’m impressed. I’ve been critical on mynewsmile.com and in this blog of Lumineers. They are a brand of ultra-thin porcelain veneers, and I have yet to see a photograph of a Lumineers case that I felt showed beautiful cosmetic dentistry. But all the photographs of DURAthin veneers that I examined today looked beautiful, and it caused me to wonder about the difference. DURAthin is also an ultra-thin porcelain, and is sometimes used in a no-prep situation. The main difference, I believe, is in the laboratory work. Lumineers, because of trademark restrictions, have to be made in the DenMat laboratory, which is a large, commercial, impersonal dental lab. My opinion, and that of other cosmetic dentists I have spoken with, is that the DenMat lab produces mediocre esthetic results. DURAthin, however, allows any laboratory technician to use it, so a dentist can have his or her own master ceramist create the smile. I think another difference is in the dentists they attract and the way the products are promoted. Lumineers are promoted to general dentists as being very easy to place and very lucrative. Consequently, they attract many dentists who really don’t know what they’re doing when they get into esthetics. Thus, I get many e-mails from their upset clients. DURAthin is taught almost as an elite technique, and the dentists that place them seem to be fairly sophisticated as far as esthetics. For example, Dr. Nils Olson, a mynewsmile.com recommended dentist who has been chosen as the new chairperson of accreditation in the American Academy of Cosmetic Dentistry, and thus could be considered at the pinnacle of excellence, uses DURAthin in his practice. Dentists like this will use a no-prep technique only when it can produce superior results. Otherwise, they will take advantage of the thinness of DURAthin by doing an ultra-conservative preparation, very possibly in enamel only, which may require no novocain and which could be likened to a mere dusting of the enamel surface. Anyway, I’m soliciting more DURAthin photographs from our expert cosmetic dentists, and keeping an eye out, and will keep visitors to this blog and website posted.